YANGON, Myanmar (CNN) -- Democracy advocate Aung San Suu Kyi plans to take the stand Tuesday to defend herself against subversion charges, her spokesman told CNN Monday. Aung San Suu Kyi was first detained in 1989 after mass protests against the military government. A small group of foreign journalists based in Myanmar will be allowed in court Tuesday, spokesman Nyan Win said from Myanmar. It is a rare opening of the court to outsiders, though no cameras will be allowed. Suu Kyi has been under house arrest for years at the direction of the military junta that rules Myanmar, which also is known as Burma. Authorities are prosecuting her, along with two of her maids, for subversion. The charges stem from a May 3 incident in which an American, John William Yettaw, 53, swam across a lake to her house and stayed for at least one night. 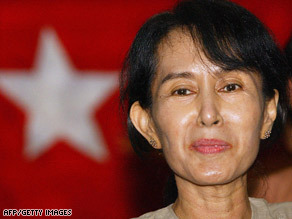 If convicted, Suu Kyi, 63, could be sentenced to three to five years in prison. The prosecution is happening inside a prison compound in Yangon, and all but one day so far has been closed to the public, including the news media and diplomats. On Monday the court heard from one final government witness, Win said. The government had asked to present 10 witnesses to the court, but was only allowed to present one -- a witness who had already given his statement to the court. The court permitted the defense's witness requests, Win said. Suu Kyi's trial began a week ago. The Nobel Peace Prize laureate heard the charges against her Friday and told the court she was not guilty. Yettaw, who also is on trial, has been charged with violating immigration laws and trespassing. Conviction on the charges would carry a maximum sentence of five years in prison. He is being represented by a lawyer selected by the U.S. Embassy in Yangon. Suu Kyi's lawyer has said his client asked Yettaw to leave her home immediately, but Yettaw refused, first saying he didn't want to swim in daylight for fear of being captured, and later blaming leg cramps. Yettaw left May 5 and was arrested shortly afterward. In court on Friday Yettaw said he made the unauthorized trip to Suu Kyi's house because he had a vision she would be assassinated and wanted to warn her, Win said. He said Yettaw could be seen muttering to himself during the proceedings, including utterances that Suu Kyi was innocent. The prosecution has prompted international criticism, with nine Nobel laureates -- including Archbishop Desmond Tutu of South Africa -- calling it a "mockery." U.S. Secretary of State Hillary Clinton called the charges against Suu Kyi "baseless" and accused Myanmar's ruling junta of "continuing (its) resistance to a free and open electoral process." Suu Kyi's lawyers are expected to argue that the pro-democracy advocate knew nothing about the American's plan to visit her and that she tried in vain to get him to leave. The defense also is expected to turn the charges on their head, arguing that the government has failed to protect Suu Kyi. The court may be trying to issue a verdict before Suu Kyi's latest round of home detention expires May 27, according to Win. Suu Kyi has been under house arrest for 13 of the past 19 years, a confinement the military junta has regularly extended. She has been barred for life from running for political office, but human rights groups suspect that Myanmar's junta is concerned her release could invigorate the opposition. Suu Kyi has been the face of Myanmar's pro-democracy movement and the focus of a global campaign to free her. Her party won more than 80 percent of the legislative seats in 1990, but she was disqualified from serving because of her house arrest, and the military junta ignored the results. It was during her house arrest that she won the Nobel Peace Prize in 1991. Suu Kyi married a British man, who died in 1999, and they have two sons. Myanmar's government now says citizens who bore children with foreigners cannot run for office.